(ARISE magazine, issue 14) On March 11 1959, Lorraine Hansberry sat down inside the Ethel Barrymore Theatre, waiting for her play A Raisin In The Sun to begin. At the time, civil rights activists were intensifying their fight against segregation in the Deep South. Inside the theatre, history was also being made as Broadway prepared to welcome its first play written by an African-American woman. 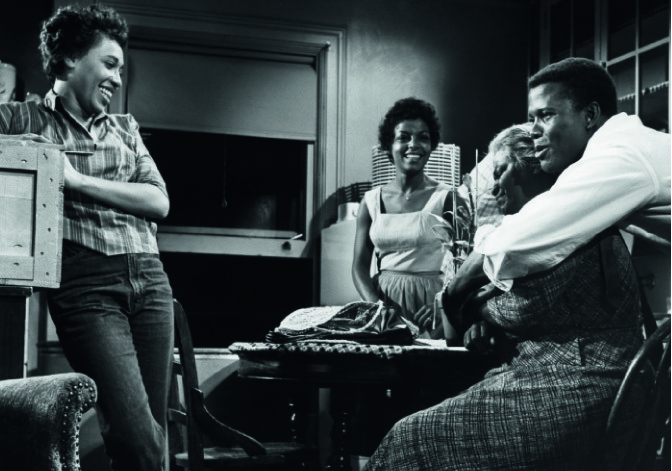 Despite a talented cast, which included Sidney Poitier, Claudia McNeil, Ruby Dee and Diana Sands, the Broadway preview on March 10 received a lukewarm reception from its mostly white audience of theatre insiders. As the curtains lifted the following night, the 29-year-old playwright clutched the hand of her producer, Philip Rose, with no idea what the evening held in store. She needn’t have worried. As the curtain was lowered, the audience roared in appreciation. Even the critics rose to their feet, calling Hansberry to join her cast on stage. “It was the most electric night I spent in the theatre,” Poitier later remembered. A Raisin In The Sun went on to enjoy a run of 500 performances, win a prestigious New York Drama Critics’ Circle Award and be nominated for a Tony Award. The cast also reprised their roles for a film adaptation in 1961. Taking its title from Langston Hughes’ poem A Dream Deferred, which begins “What happens to a dream deferred?/Does it dry up/like a raisin in the sun?”, the play centres around the Younger family, who are awaiting a life insurance cheque for U$10,000 following the death of the father. They disagree on how best to spend the money: Mama dreams of a bigger home; her frustrated son, Walter Lee, of hanging up his chauffeur’s cap and opening a liquor store; and her daughter, Beneatha, of becoming a doctor. When the family are offered money to not move into a white neighbourhood, they must decide what is more important: money or dignity. Since 1961, A Raisin In The Sun has returned in many forms including a musical adaptation, Raisin, which won a Tony Award for best musical in 1973, and George C Wolfe’s sketch The Last Mama-on-the-Couch Play, which mocked the by now beloved classic. In 2004 the play returned to Broadway for a US$2.6million revival with Sean ‘P Diddy’ Combs reprising the role made famous by Poitier. While reviews of Combs’ performance were mixed, Phylicia Rashad and Audra McDonald, who respectively played Mama and Ruth, scooped a Tony Award each and the whole cast also starred in a film version in 2008. When Hansberry died of cancer in 1965, at the premature age of 34, Martin Luther King sent a message to be read at her funeral: “Ms Hansberry’s commitment of spirit, her creative ability and her profound grasp of the deep social issues confronting the world today will remain an inspiration to generations yet unborn.” The fact that A Raisin In The Sun continues to inspire and instruct students, actors and activists decades later is testament of the veracity of King’s prophetic words.